Not to 25 as it turned out. 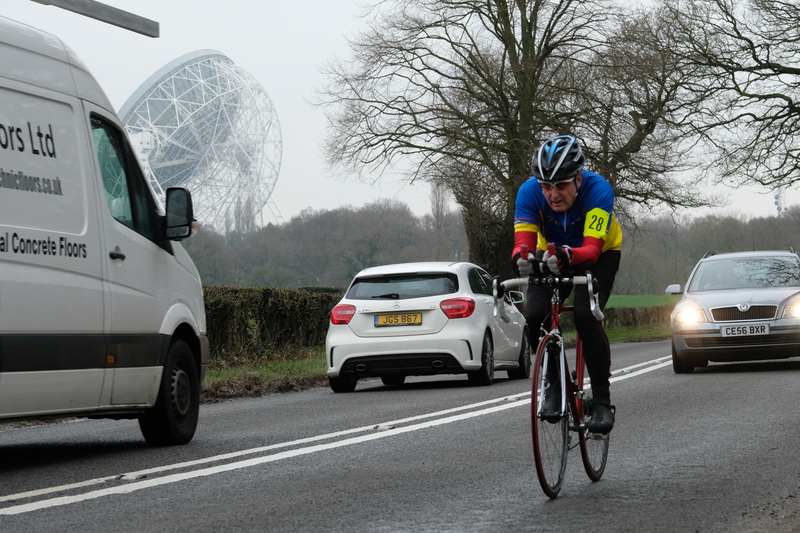 The Withington Wheelers 25 was, at the last minute, shortened to a 10, due to roadworks at the Ollerton crossroads, complete with temporary traffic lights. As I drove out to the TT, it sporadically hammered down with bursts of heavy rain. It didn’t bode well for TTing at all. All changed as I parked up at Goostrey village hall however, as the last of the showers subsided, the air warmed, and the roads started to dry. 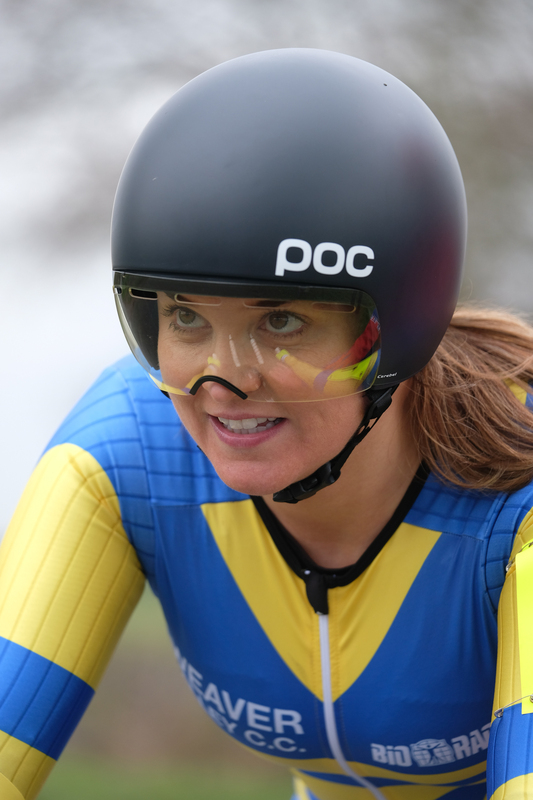 Still grinning, Lynsey warmed up and went to the start line, put on her race face, and started down Twemlow lane at a steady pace. That’s me race face that is, and I’ve got no pins in me number. Pushing a good sized gear along Chelford Road up to the roundabout, there was the usual ton of traffic at the roundabout, which caused many riders to cautiously approach, and tentatively and sensibly negotiate this busy interchange before pushing back down Chelford Road towards the finish, still pedalling consistently, although finding it difficult, facing the wind. The cars just couldn’t keep up. 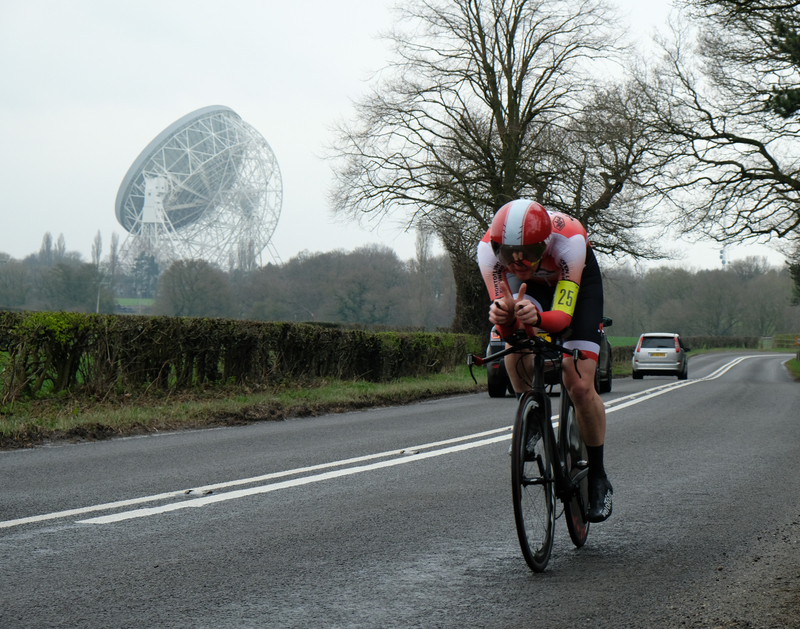 Andy Milligan came storming along Chelford Road, winding the gear round and looking powerful. 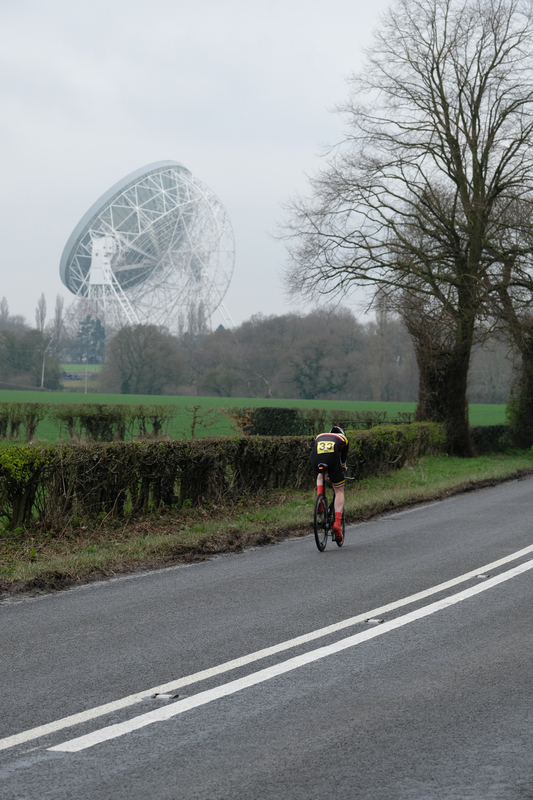 Winding it along by the Lovell telescope. I was shooting just by Terra Nova School, and it didn’t seem to take long before I saw him hurtling towards me, with a determined look on his face. 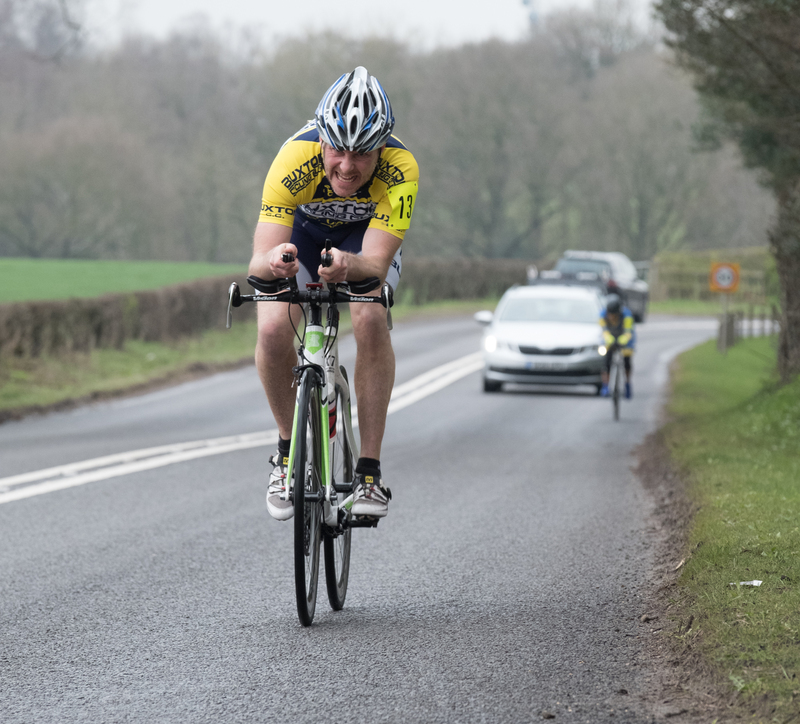 Shortly after, as he counted at the HQ, Andy dropped off the gas shortly after, as he thought he’d reached the finish line, only to then realise that he wasn’t at the finish at all, and had to dig in again, losing valuable seconds. Both did good times, on a day that most reported not to feel fast at all. 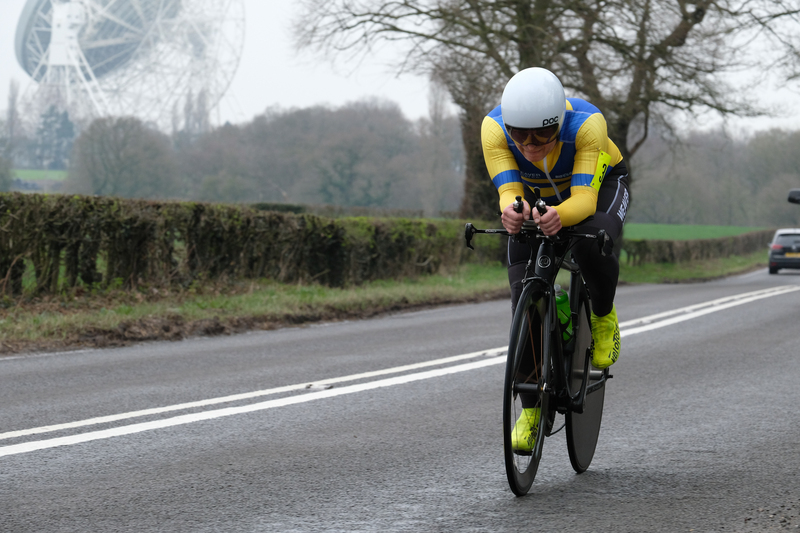 Lynsey came in with a 29:08 in the novice competition, quietly powering along under the 30 minute barrier, at an average speed of 20.59mph, and went away with the ladies novice prize (there is a story here)! 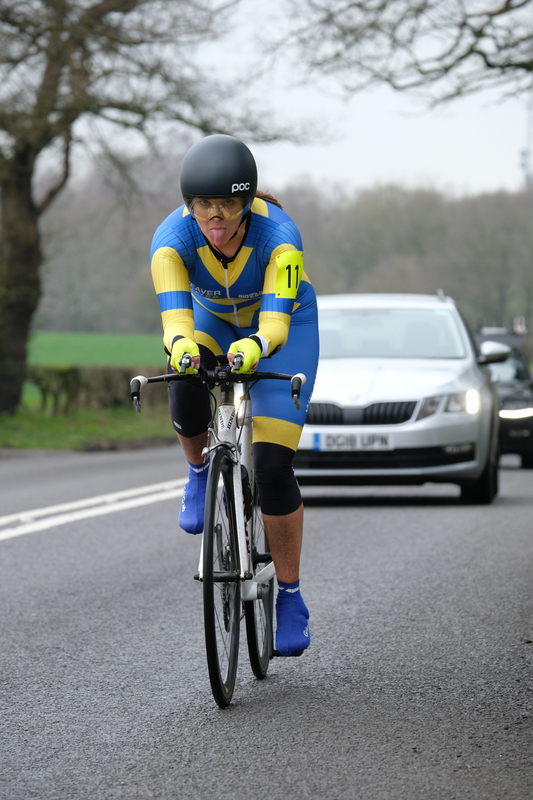 A good marker before starting the club 10 mile TT season with and one that she will improve on during the year. 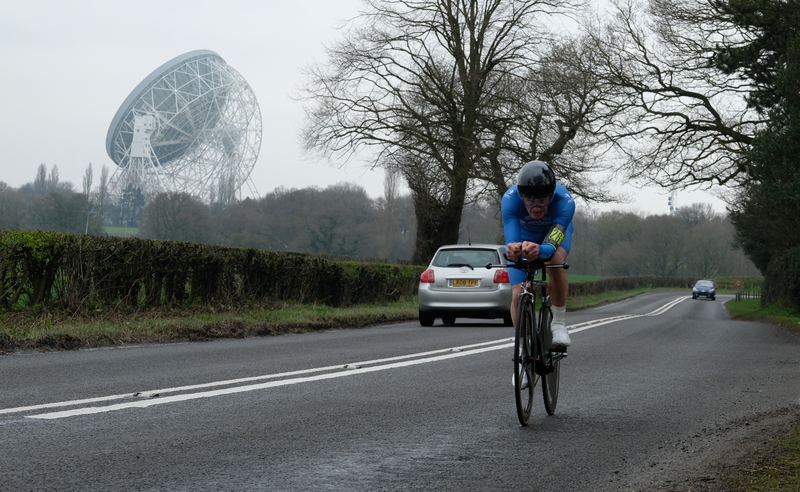 Andy also set an excellent 24:16, averaging 24.74mph, despite his relaxed(!) finish. 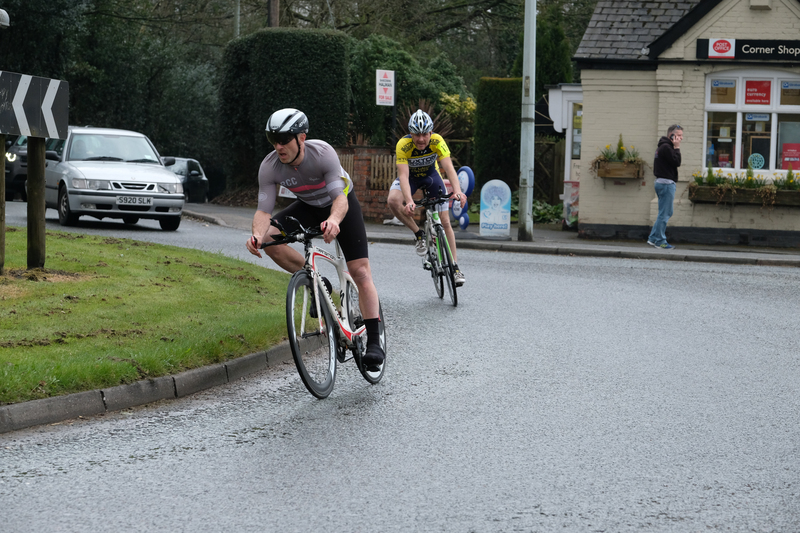 In a field of 77 finishers, Andy was 33rd. The winning time was set by Simon Wilson from Ribble Pro Cycling, with a monster 20:20, a minute and six seconds ahead of Mark Turnbull, Torq Performance with a 21:26, who finished 15 seconds ahead of Joseph Dobson of Manchester Bicycle Club with 21:41. 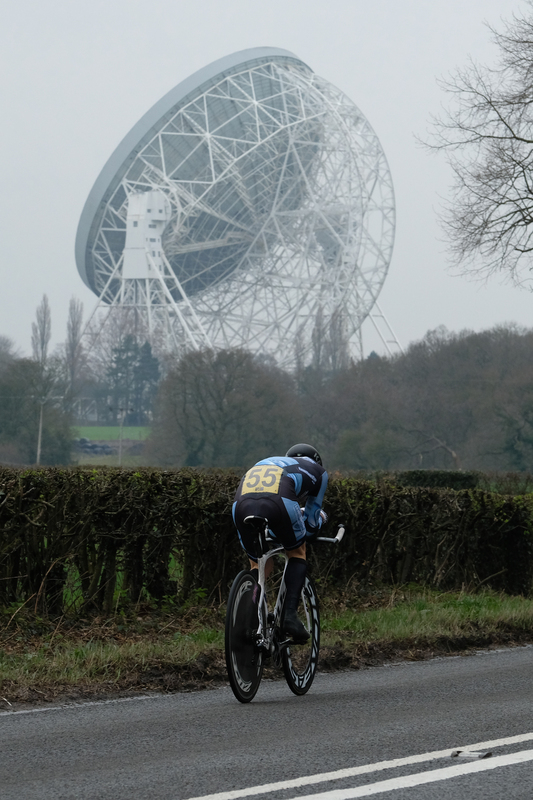 A few images from a bad day with the camera (unless riders like to see themselves with vans in the shot. Terribly busy traffic spoiling shots that I wanted to get!). Images in no particular order. 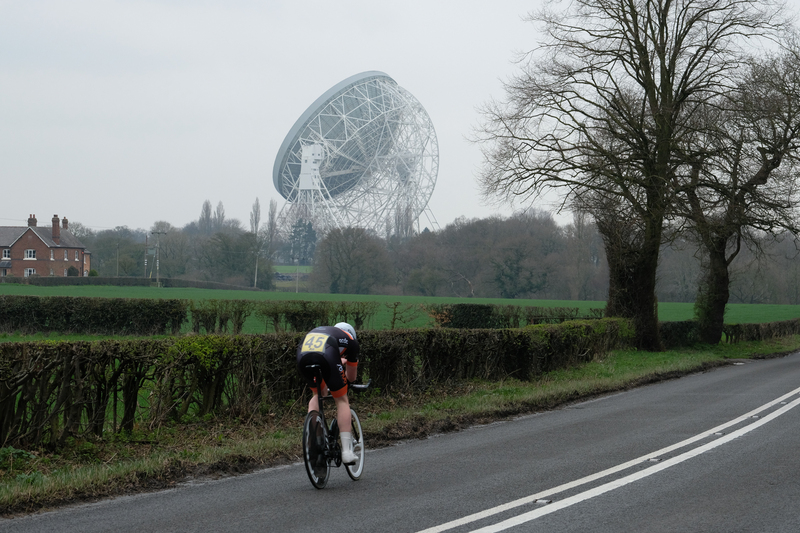 That’s the Lovell radio telescope that is. When construction was finished in 1957, the telescope was the largest steerable dish radio telescope in the world at 76.2 m (250 ft) in diameter; it is now the third-largest, after the Green Bank telescope in West Virginia, United States, and the Effelsberg telescope in Germany. It was originally known as the “250 ft telescope” or the Radio Telescope at Jodrell Bank, before becoming the Mark I telescope around 1961 when future telescopes (the Mark II, III, and IV) were being discussed. 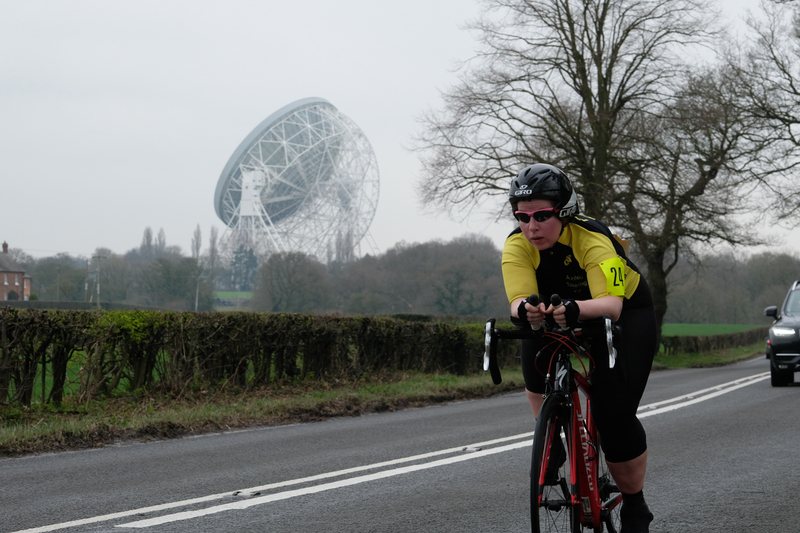 It was renamed to the Lovell Telescope in 1987 after Sir Bernard Lovell, and became a Grade I listed building in 1988. The telescope forms part of the MERLIN and European VLBI Network arrays of radio telescopes. There. Every day is a school day. 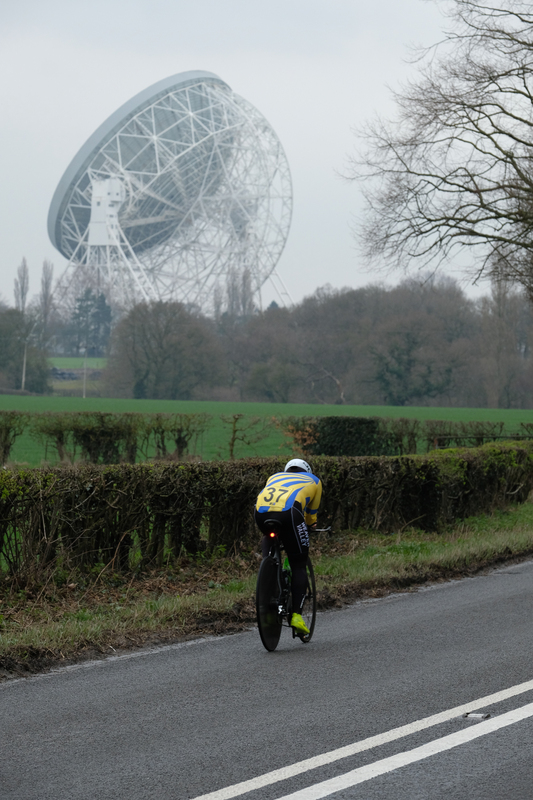 That isn’t Sir Bernard Lovell though, that is no 21, Stephen Sladin, of Congleton CC. 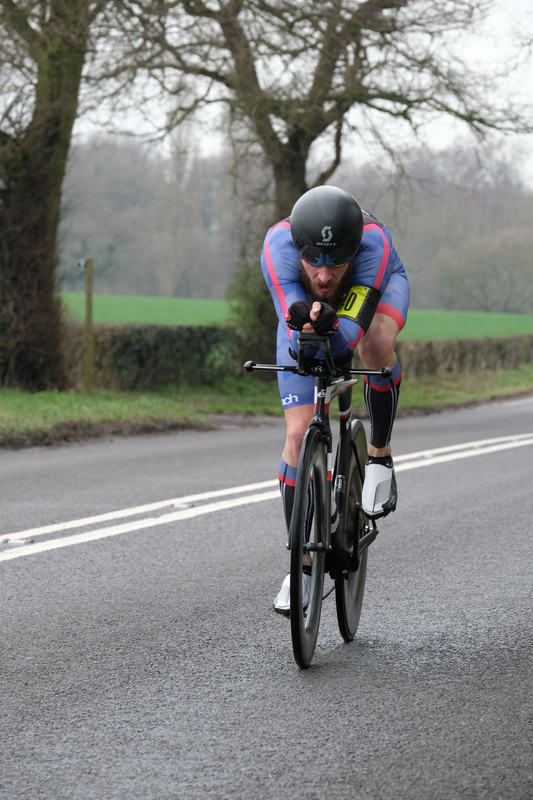 Not sure whether Ian Haddock (Warrington RC) is going for a new ‘aero thumbs-up’ position, or just being friendly, either way, he did a 23:27. so it must work. 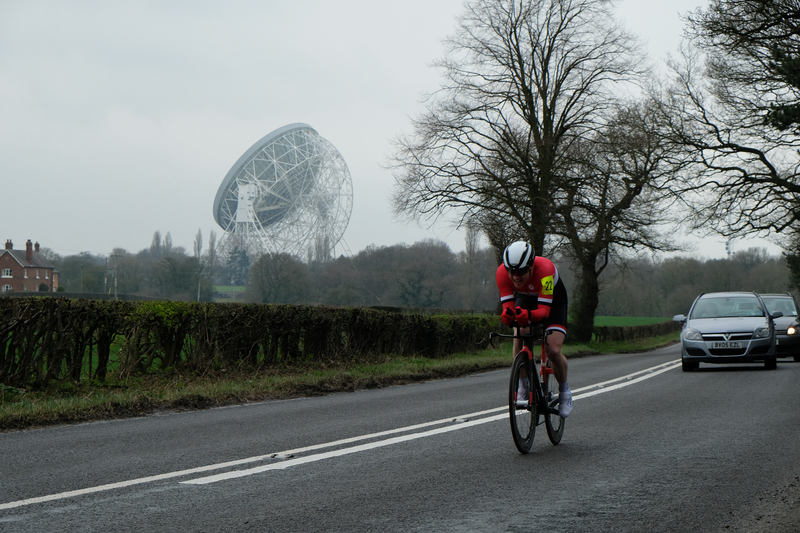 More aero-dynamic experimentation. This time, ‘concorde-tongue’. 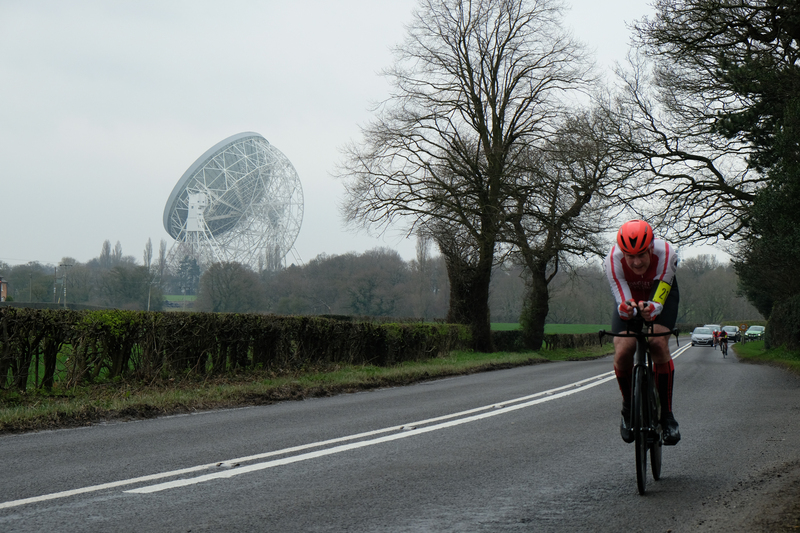 Now that’s aero. Not the beard though, that’s not aero. That’s just beardy.